When it is cold, rainy, and I have the day off, nothing more reminds me of English mornings and fresh bread! One of my distinct memories of England is that breakfast is toast, it may or may not have beans on it, but I always ate toast. One of my first interactions with fresh bread was when I stayed with my friend Alice of Smokin’ Tofu in London. Each time I went over I had a different fresh loaf of bread, from whole wheat to tomato basil. I was smitten with fresh bread and because it was all around me I never desired much to make it myself. 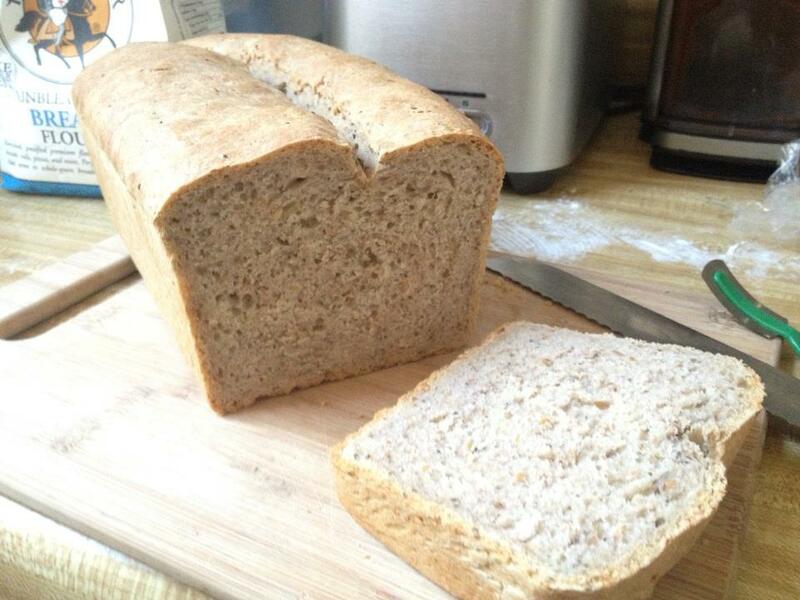 It was a year later once I was back in America after reading the 40 ingredient list of store bought bread that I began to become interested in making my own. Bread became an obsession of mine after I lived at my friend Natalie’s house a couple years ago. Her father baked fresh bread, and I had tasted nothing like it before. 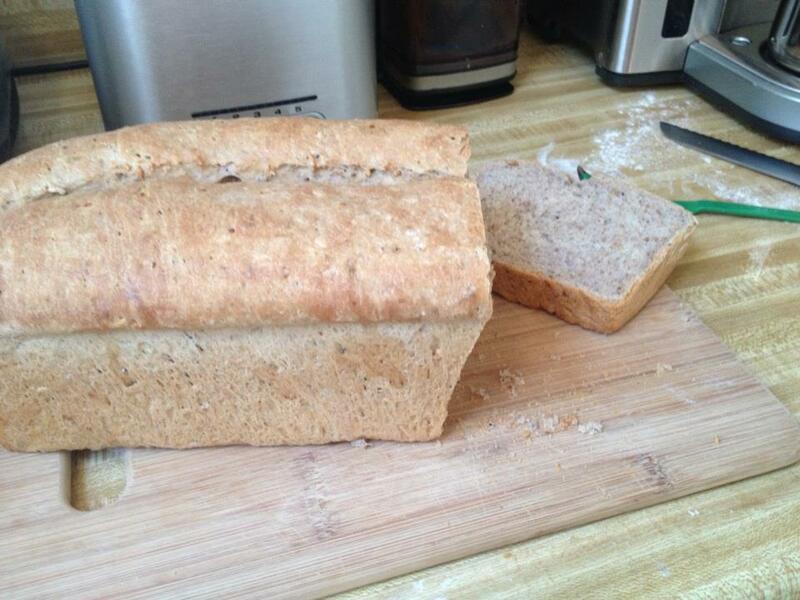 Once I moved out I set about creating the perfect sandwich bread…unfortunately that did not happen right away. I received brick after brick after brick of hard dense dough…it tasted all right if you put it in the toaster, but it was nothing like her fathers. After a year of baking bread, both the delicious, and inedible mistakes I have forged a relationship with yeast. Yeast is the most important part of the bread even though it is such a small piece of the overall dough. That is why it is so important to check to make sure your yeast is alive! Bread flour is an important part of baking bread because it has more gluten in the flour, and allows a better raise. For first time bread bakers remember to follow a recipe, but understand that there is no perfect recipe for bread. Depending on your climate you may need more water or less water, it changes from one bag of flour to the next. This is because one shipment may have gone through the dessert, and another over the mountains. Some in plains, trains…ok I think you get the picture. The important part to remember is that water is the variable that changes, everything else will stay the same in your kitchen! Now on to some delicious bread with a touch of whole wheat. 1. Combine a 1/2 cup warm (too hot of water will kill the yeast, and too cold of water won’t activate it. Think bathwater that you have been sitting in for a bit too long) water with the yeast. Stir until combined and wait until bubbles begin to form and the mixture froths a little. If there is no bubbling after 10 min, scratch the project and go buy new yeast. If it activates and there are bubbles continue with the bread making process. 2. In a food processor with the dough blade attached add the flour and seeds, reserve the nuts. Pulse a few times to incorporate the flour and seeds. Add the yeast, turn on the motor and take the feeding tube out from the top to create an opening. Add the warm soy milk first and then add the reserved 1/2 cup water slowly until the dough forms into a ball and picks up all of the loose flour. Then add the salt and walnuts and process until the dough comes together, about 30 seconds. Open the top of the processor and make sure the dough is pliable, if hard turn on for another 30 seconds. 3. Shape the dough into a ball and place in a oiled bowl to let raise. Cover with plastic wrap and let rise for 90 minutes. 4. The dough should be double in size after 90 minutes. I don’t know about you but I find it easier to follow instruction if I can visually watch. Click here for a simple way to shape a bread loaf. Follow her instructions, but because this recipe makes one loaf you don’t need to cut the dough in half. 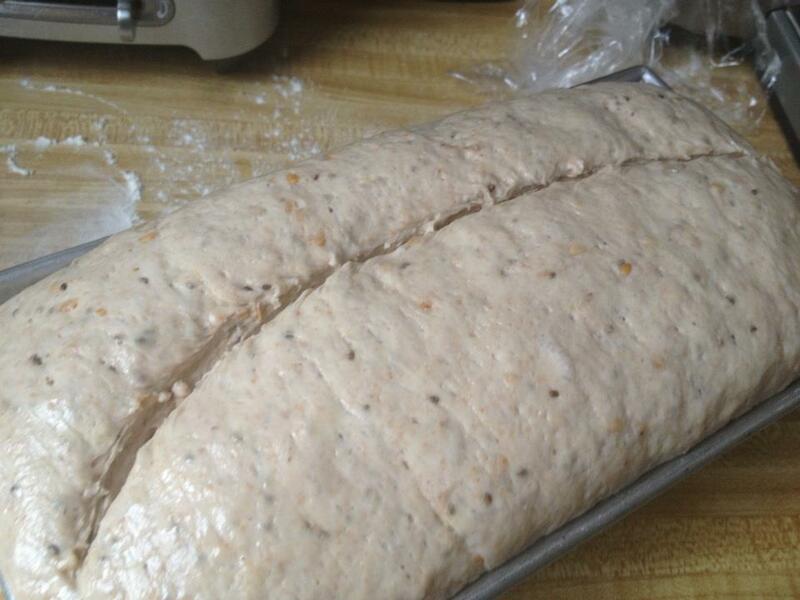 Place the dough in a greased 2 lb loaf tin and cover with oiled plastic wrap. Preheat the oven to 425 with a oven proof dutch oven or pan on a lower shelf. Set loaf aside to rise for 1 hour or until it domes a bit above the top of the tin. 5. When the dough is ready, score the top with a serrated knife and brush with olive oil. Then place it in the oven and wearing an oven mitt, pour a cup of boiling hot water into the dutch oven. This will create steam that you want to keep in the oven so quickly close the oven door. Turn the temperature down to 375 and bake for 50 minutes. Let cool for 20 minutes and enjoy!